In cancer stem cell theory, breast cancer stem cells (BCSCs) are postulated to be the root cause of recurrence and metastasis in breast cancer. Discovery of new biomarkers and development of BCSC-targeted therapy are practical issues that urgently need to be addressed in the clinic. However, few breast cancer stem cell targets are known. Given that there are few BCSCs, performing transcriptome sequencing on them thus far has not been possible. With the emergence of single-cell sequencing technology, we have now undertaken such a study. We prepared single-cell suspensions, which were sorted using flow cytometry from breast tumor tissue and adjacent normal breast tissue from two HER2-positive patients. We obtained BCSCs, breast cancer cells, mammary cells, and CD44+ mammary cells. Transcriptome sequencing was then performed on these four cell types. 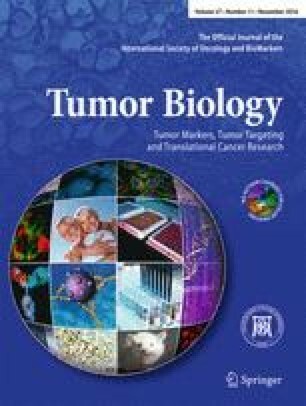 Using bioinformatics, we identified 404 differentially expressed BCSC genes from the HER2-positive tumors and preliminary explored transcriptome characteristics of BCSCs. Finally, by querying a public database, we found that CA12 was a novel prognostic biomarker in HER2-positive breast cancer, which also had prognostic value in all breast cancer types. In conclusion, our results suggest that CA12 may be associated with BCSCs, especially HER2-positive BCSCs, and is a potential novel therapeutic target and biomarker. The online version of this article (doi: 10.1007/s13277-016-5351-0) contains supplementary material, which is available to authorized users. The study was supported by a research grant from the Health and Family Planning Commission Research Project of Heilongjiang Province(2016-082). The Research Ethics Committee of Harbin Medical University Cancer Hospital approved this study. Written informed consent was obtained from all patients, and specimens were handled and made anonymous according to ethical and legal standards.